Will ever-more sensitive screening tests for cancer lead to longer, better lives? Will anticipating and trying to prevent the future complications of chronic disease lead to better health? Not always, says Robert Aronowitz in Risky Medicine. In fact, it often is hurting us. Exploring the transformation of health care over the last several decades that has led doctors to become more attentive to treating risk than treating symptoms or curing disease, Aronowitz shows how many aspects of the health system and clinical practice are now aimed at risk reduction and risk control. He argues that this transformation has been driven in part by the pharmaceutical industry, which benefits by promoting its products to the larger percentage of the population at risk for a particular illness, rather than the smaller percentage who are actually affected by it. Meanwhile, for those suffering from chronic illness, the experience of risk and disease has been conflated by medical practitioners who focus on anticipatory treatment as much if not more than on relieving suffering caused by disease. Drawing on such controversial examples as HPV vaccines, cancer screening programs, and the cancer survivorship movement, Aronowitz argues that patients and their doctors have come to believe, perilously, that far too many medical interventions are worthwhile because they promise to control our fears and reduce uncertainty. Risky Medicine is a timely call for a skeptical response to medicine’s obsession with risk, as well as for higher standards of evidence for risk-reducing interventions and a rebalancing of health care to restore an emphasis on the actual curing of and caring for people suffering from disease. "The rise of medical statistics has not just changed the way physicians evaluate therapies. It has also fundamentally changed our understanding of health and disease. As physician and historian Robert Aronowitz argues in Risky Medicine: Our Quest to Cure Fear and Uncertainty, it is no longer necessary to feel ill in order to be ill. A patient may feel fine and yet be treated as sick because her indicators point to elevated risk of disease or premature death. The experience of being “at risk” has, Aronowitz contends, converged with the experience of disease itself." 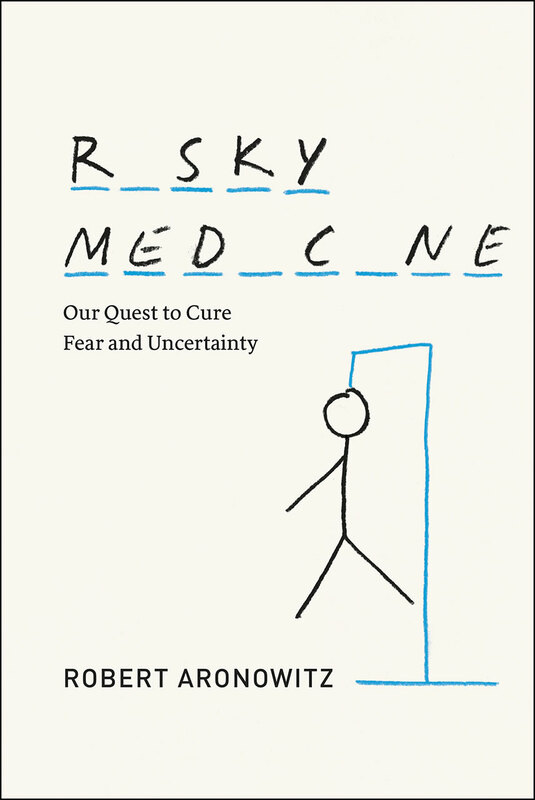 "In Risky Medicine: Our Quest to Cure Fear and Uncertainty, physician and leading medical historian Robert Aronowitz maps the historical emergence of the risk paradigm in health: the notion that the task of medicine is to reduce and manage the probability of future illness rather than treating present disease." "Aronowitz explores the transition from a time when medical encounters were primarily dealt with the management of felt bodily experience and physical signs to highly probabilistic risk knowledge that increasingly generated by medically-directed surveillance and probing. In tracing this transformation, Aronowitz aims to contribute to the history and sociology of medicine, in particular the study of disease and the disease experience as well as to our thinking about policy choices."